BACKGROUND AND PURPOSE: Ensuring the translatability of primate stroke models is critical for preclinical testing of cerebroprotective strategies, and such models would benefit from further characterization of the experimental ischemic tissue. Our purpose was to examine the cerebral metabolic response to stroke in baboons with MR spectroscopy and to correlate metabolite levels with functional neurologic outcomes. METHODS: Seven baboons underwent 1 hour of middle cerebral artery occlusion. At 3 and 10 days, each animal was imaged with traditional MR imaging and multivoxel proton 1H-MR spectroscopy, and a neurologic examination was performed. Spectra obtained from the infarcted hemisphere of each animal were compared with the contralateral hemisphere, and metabolite levels were correlated with neurologic outcome scores. RESULTS: Spectra obtained at 3 days postischemia revealed prominent lactate (LAC) resonances and attenuated N-acetylaspartate (NAA) peaks in infarcted hemispheres. Ten-day spectra showed persistence of these findings in animals with large strokes (>30% of the hemisphere), with partial normalization of the spectra in animals with small strokes (<30% of the hemisphere). Mean area under the curve from LAC spectra had a negative correlation with functional outcome by 2 different scoring systems (r2 = 0.72 and 0.73), whereas NAA showed a positive correlation (r2 = 0.79 and 0.62). CONCLUSIONS: The metabolic alterations observed in our primate model of reperfused ischemia by 1H-MR spectroscopy recapitulate those seen in clinical stroke. Furthermore, correlations between LAC and NAA peaks with functional outcome further suggest that MR spectroscopy may play a role in outcome prediction following cerebral infarction in higher primates. MR imaging, an indispensable tool for the diagnosis of clinical stroke, has proved long-term prognostic capabilities.12–16 It is also used to evaluate experimental animal stroke, and in primates, MR imaging infarct volumes can be calculated as a primary study end point.9 Despite the great utility of MR imaging in determining anatomic parameters in vivo (ie, infarct size), it provides little-to-no information about regional neurobiochemistry. However, when MR imaging is combined with MR spectroscopy, a noninvasive imaging technique that characterizes metabolite profiles,17 the neurobiochemical changes induced by cerebral ischemia can be examined. Furthermore, when incorporated into a primate model of ischemia, the effects of a particular therapeutic strategy on cerebral metabolites can be examined. In the past decade, techniques for anatomic localization of MR spectroscopy signals to single volumes of tissue in vivo have been developed and applied to numerous clinical conditions. Particularly, this tool has been used to study the metabolic changes in cerebral tissues after both clinical stroke18–22 and experimental primate ischemia.23, 24 Recently, localization of multiple volumes in 2D or 3D matrices has proved to be the method of choice to study brain in vivo.25 However these methodologies have yet to be applied to either clinical stroke or nonhuman primate models. In the present study, we sought to use in vivo anatomically localized 2D 1H-MR spectroscopy to characterize the qualitative biochemical properties of our nonhuman primate model of focal reperfused cerebral ischemia. We aimed to determine if the pattern and timing of prominent observed spectral peaks parallel those of clinical stroke. Furthermore, we sought to analyze the levels of LAC and NAA by MR spectroscopy and compare them with 2 functional neurologic scoring systems that have been refined for use in primate studies.10, 33 The purposes of these experiments were both to further demonstrate the eminent translatability of our stroke model and to provide additional evidence for the prognosticating role of 1H-MR spectroscopy in clinical stroke. As part of an ongoing prospective randomized cerebroprotective trial testing the ability of a novel antioxidant therapy to improve outcomes by reducing postischemic oxidative stress, 7 male control-group baboons (Papio anubis; Buckshire Farms, Perkasie, Pa), weighing 14 ± 2 kg, were studied. Before inclusion in the study, all animals were observed to be disease-free for at least 90 days. A skilled team of veterinarians was responsible for making medical and ethical decisions regarding the health of these animals. All procedures on these animals were approved by the Institutional Animal Care and Use Committee and were performed in accordance with the established National Institutes of Health Guide for the Care and Use of Laboratory Animals. All 7 of the study animals survived the full 10-day period before being sacrificed per protocol. The circle of Willis was exposed via a transorbital craniectomy performed with a Midas Rex high-speed pneumatic drill (Medtronic, Minneapolis, Minn). Micro-Yasargil aneurysm clips (Aesculap, Palo Alto, Calif) were placed on each anterior cerebral artery, proximal to the anterior communicating artery (bilateral A1 segments), and across the left internal carotid artery, occluding the anterior choroidal artery. Motor-evoked potentials were run bilaterally to confirm signal-intensity drop-out from the left hemisphere. Following the motor-evoked potentials signal-intensity loss, the clips were removed to allow reperfusion of the left hemisphere, resulting in re-establishment of neurologic function, which was defined by full return of motor-evoked potential signals. The clips were then replaced for 75 minutes of arterial occlusion. Ipsilateral motor-evoked potential drop-off was again confirmed. After clip removal, a layer of gelatin sponge (Gelfoam, Pfizer, New York) was placed over the dural defect, and methylmethacrylate was used to fill the orbit. Postoperatively, the animals remained intubated, with continuous monitoring for 18 hours by a member of the neurosurgical team. Physiologic parameters (including ICP, CVP, partial pressure of CO2, core/brain temperatures, and systemic blood pressure) were regulated during this period. Afterward, the 7 animals were deemed able to survive with unassisted respiration and were extubated and monitored closely in the intensive care unit. Each animal was monitored for 10 days, after which they were sacrificed and their brain immediately fixed for further pathology studies. All animals were neurologically intact before the experimental protocol. Following extubation, assessment of the ability to self-care and neurologic examinations were conducted by 2 independent observers on a daily basis. These evaluations were quantified by using 2 functional neurologic scoring systems as previously described.10, 33 Briefly, the Spetzler score33 is a global assessment of function, and the Mack scale10 uses a task-based assessment (higher scores being better in both). Combined MR imaging/MR spectroscopy studies were performed on day 3 and 10 postoperatively on 2 clinical scanners (1.5T Signa unit, GE Healthcare, Milwaukee, Wis; 1.5T Intera unit, Phillips Medical Systems, Best, the Netherlands). Whole brain MR imaging was performed at each time point, obtaining standard T2-weighted, fast spin-echo, fluid-attenuated inversion recovery, and diffusion-weighted images. These images were used to calculate infarction volumes as previously described.6, 9 Using the T2-weighted axial images, we identified the infarct and selected and used the image showing the largest transverse-section infarct area (largest T2-weighted hyperintensity) to prescribe the multivolume localized 1H-MR spectroscopy. Single-section 2D spectroscopy was performed by using chemical shift imaging (CSI) techniques at the level of the selected image. The acquisition parameters were TR/TE, 1600/144 ms; field of view (FOV), 200–240 mm (1 animal, 240; 6 animals, 200); 16 × 16 phase-encoding steps; 1024 time-domain points; and 15 mm in thickness. In addition, a chemical shift selective saturation pulse was used to achieve water suppression while the volume of interest was kept inside the brain parenchyma, thereby preventing the excitation of extracerebral lipids that could contaminate the brain volumes. Lactate observation was favored by inverting its methyl signal intensity by using a TE of 144 ms. The postacquisition processing of the CSI spectral dataset was performed by using a proprietary spectral analysis program (3D-iCSI). The signals were smoothed with a gaussian filter of 2 Hz, Fourier transformed in space and time, and phased globally. Interactive voxel shifting was applied by using the selected image as a reference to ensure that there was a clear demarcation between left and right hemispheric voxels. Limited zero-order (x, y, and z) shimming was performed both automatically and manually. Area under the peaks was calculated by using principal component analysis, a standard subroutine available on our proprietary processing program. Each animal was studied successfully at both 3 days and 10 days poststroke at the standardized position within the cerebrum with the 2D multivoxel technique. Infarction volumes were calculated as per the original protocol with 4 of the 7 animals experiencing large (>30% of hemisphere; mean, 50.1 ± 5.6%) infarctions, and the remainder having smaller (<30% of hemisphere; mean, 17.6 ± 6.0%) strokes. 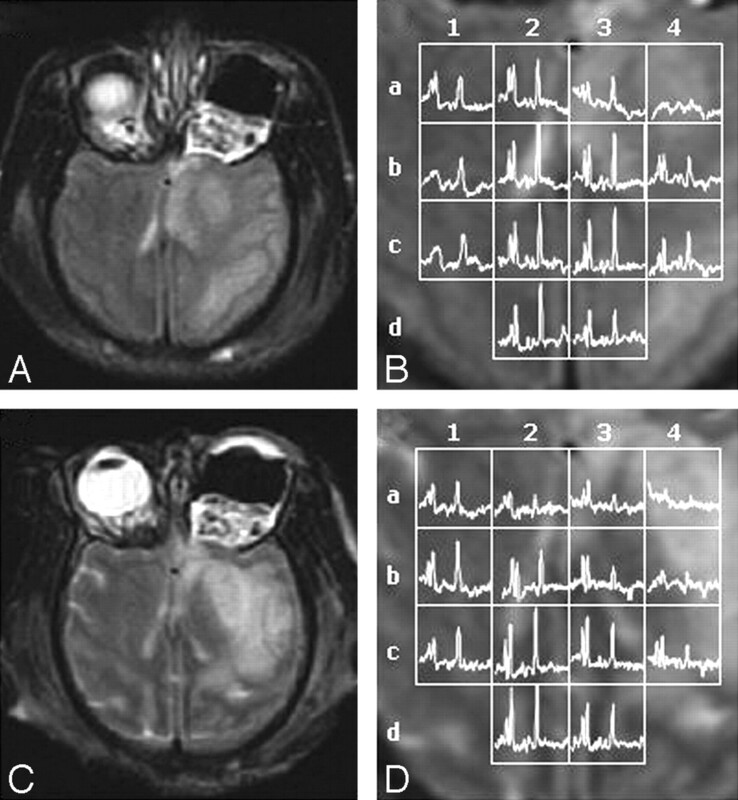 By 3 days poststroke, the primary difference between spectra acquired on the control (right) and infarcted (left) hemispheres was the appearance of LAC in the latter (Fig 1). Also prominent was a reduction of NAA in comparison to CHO and Cr in the top spectrum of the infarcted hemisphere (Fig 1). This reduction was not as visually evident in the lower infarcted spectrum; however, the integration values were similar, secondary to the slender nature of the NAA peak in the infarct. These differences in spectral quality were due to spatial differences in field homogeneity that do not interfere with the final processing and analysis of signals because there was a high signal-intensity-to-noise ratio in all spectra. An example of a 1HMR spectroscopy study on a nonhuman primate 3 days after left hemispheric stroke (infarct volume, 15% of the hemisphere). A, Selected T2-weighted axial image with 2D MR spectroscopy overlay grid (FOV of the 2D-CSI dataset, 240 mm; 16 phase-encoding steps were acquired per side; section thickness, 15 mm; voxel cubic volume, 3.38 mL) demonstrates an intracerebral hyperintensity localized mainly to the anteromedial area of the left hemisphere, diagnostic for infarction. Remnants of the surgical approach to the circle of Willis are seen in the left orbit. Inside each voxel on the grid, the corresponding 1H spectrum is shown after processing (see Methods). Spectra from the 4 highlighted voxels are expanded in B. Signal intensity assignments are shown on the expanded spectra, correlating with both normal and abnormal signals. To examine the trending levels of metabolites in infarcted brain, we compared MR imaging and 1H-MR spectroscopy data collected at 3 days and 10 days poststroke from animals with small strokes (Fig 2) and animals with large strokes (Fig 3). In animals with small strokes, the early depression of MR spectroscopy signals of NAA, Cr, and CHO at day 3 in the infarcted hemisphere (Fig 2B, spectra 3a and b) was essentially corrected to normal levels by day 10 (Fig 2D, spectra 3a and b). However, the LAC signals, though reduced in intensity, were still visible in the infarcted tissue at day 10 (Fig 2, compare spectra 3a and 4a in images B and D). Furthermore, not all of the examined brain metabolites returned to baseline levels in the same timeframe. 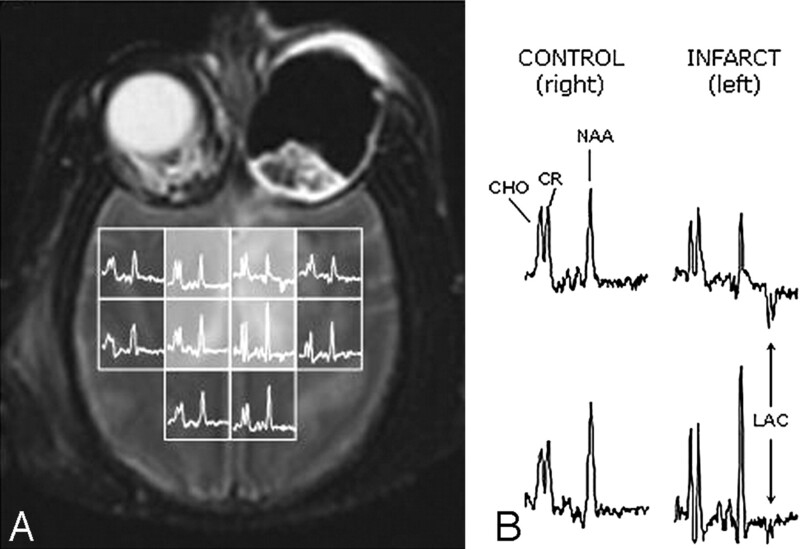 In spectrum 4a (Fig 2D) for example, the CHO and Cr signals were visible 10 days after infarction, even though the NAA was still reduced. Representative data from a 1H-MR spectroscopy study on a nonhuman primate at both 3 days (A, -B) and 10 days (C, -D) following a small left hemispheric stroke (infarct volume, 28% of hemisphere). A and C, T2-weighted MR images are used to prescribe the spectral sections at (A) day 3 and (C) day 10. B and D, 1H-MR spectroscopy voxel grid and corresponding normalized spectra (FOV, 200 mm; thickness, 15 mm; each voxel was a volume of 15 × 12.5 × 12.5 mm per side with a capacity of 2.34 mL) are overlaid on magnified views of the T2-weighted MR images from (B) day 3 and (D) day 10. The voxel grids are labeled horizontally with numbers (1-4) and vertically with letters (a–d) to allow direct comparison between spectra collected at 3 and 10 days. Representative data from a 1H-MR spectroscopy study on a nonhuman primate at both 3 days (A, -B) and 10 days (C, -D) following a large left hemispheric stroke (infarct volume, 67% of hemisphere). A and C, T2-weighted MR images are used to prescribe the spectral sections at (A) day 3 and (C) day 10. B and D, 1H-MR spectroscopy voxel grid and corresponding normalized spectra (same parameters as in Fig 2) are overlaid on magnified views of the T2-weighted MR images from (B) day 3 and (D) day 10. The voxel grids are labeled horizontally with numbers (1-4) and vertically with letters (a-d) to allow direct comparison between spectra collected at 3 and 10 days. A more striking and complex set of changes was observed in animals with large strokes. In this group, a pronounced reduction of NAA, CHO, and Cr signals was evident by day 3 (Fig 3B; spectra 3a, 3b, 4b,and 4c), and these signals remained depressed or underwent further reduction by day 10 (Fig 3D; spectra 3a, 3b, 4b, and 4c). These spectral changes were accompanied by prominent LAC peaks in the infarcted hemisphere (Fig 3B, -D; spectra 3b, 4b, and 4c) and the appearance of spectral silence (Fig 3D, spectrum 4a). 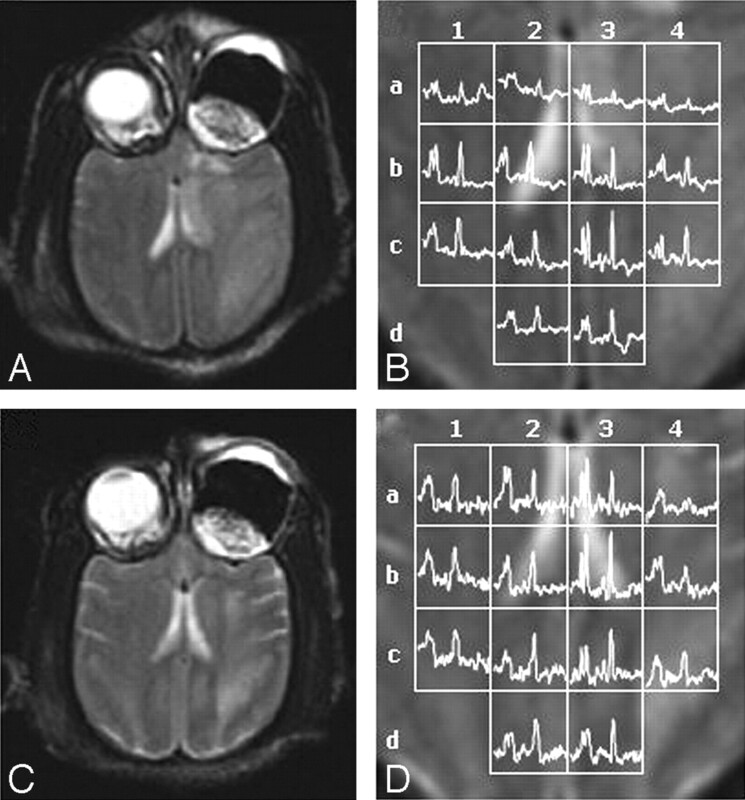 Regions of cerebral damage that appeared to improve from 3 to 10 days by MR imaging (Fig 3B, -D; voxel 3b) still in fact showed severe perturbation of metabolite levels by MR spectroscopy (global reduction of normal signals with inversion of the ratios NAA/CHO and NAA/Cr and the new appearance of LAC by day 10). In addition, a decrease of normal brain signals in the right (control) hemisphere between day 3 and day 10 occurred in spectrum 2a and to a lesser extent in spectrum 2b (Fig 3B, -D). These spectral changes suggest that the infarct area could be affecting the right hemisphere by day 10. To correlate changes in metabolite levels with functional outcomes of the experimental primates, we regressed the Spetzler and Mack scores for each of the animals at 10 days poststroke against both mean NAA and LAC values obtained from 1H-MR spectroscopy (Fig 4). Metabolite levels were expressed as ratios of mean integral value (area under the curve) from the voxels of the infarcted hemisphere to the mean NAA integral value from voxels of the control hemisphere. Using logarithmic regression, we obtained a positive correlation (higher values represent better outcome) between NAA values in the ischemic hemisphere and outcome for both the Spetzler (r2 = 0.79) and Mack (r2 = 0.62) scoring systems (Fig 4A, -B). The negative correlation (higher values represent worse outcome) observed for LAC was even stronger, with correlation coefficients reaching 0.72 and 0.73 for the respective scales (Fig 4C, -D). 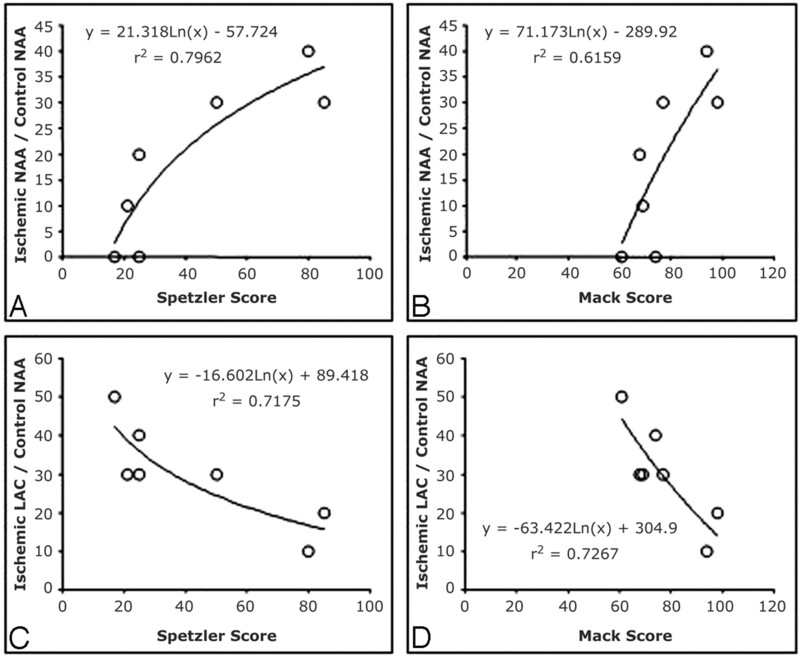 Plots demonstrate the correlation between the ratio of ischemic hemisphere mean integral value (area under the curve) of NAA (A, B) and LAC (C, D) with the control hemisphere mean integral value of NAA and the Spetzler score (A, C) and Mack scale (B, D) functional outcome measurements at 10 days postischemia. There is a positive correlation shown in (A) and (B) for the metabolite NAA on both scoring systems, with higher fractional NAA correlating with better functional outcome (higher scores). In contrast, there is a strong negative correlation observed for LAC (C, -D), with higher fractional LAC ratios being associated with lower (worse) functional outcome scores (Spetzler, r2 = 0.72; Mack, r2 = 0.73). Animal stroke models afford the opportunity to observe the mechanisms of cerebral ischemia, its sequelae, and the effects of therapeutic interventions in reproducible and controlled systems. The use of nonhuman primates as advanced stroke models is of particular value because of their significant anatomic and physiologic homology to the human brain and the ability to monitor higher order behaviors.8–11 MR imaging has been central for establishing such models because the MR imaging signal intensity characteristics of experimental stroke recapitulate those of clinical stroke, and the infarct volumes as deduced by MR imaging closely correspond to areas of infarcted tissue in postmortem specimens.9, 24 However, the effects of ischemia on cerebral tissue are exceedingly complex and can result in dramatic changes in neuronal metabolism.34, 35 It is, therefore, important to use experimental models that closely mirror the neuronal metabolic alterations of cerebral ischemia–reperfusion injury seen in the human disease state. In this study, we aimed to further validate our established primate model of acute and subacute stroke6, 9, 10 with the use of anatomically localized multi-volume 1H-MR spectroscopy in vivo. 1H-MR spectroscopy has gained acceptance as a powerful noninvasive tool to monitor the in vivo metabolic and bioenergetic status of cerebral tissue following stroke in humans. However, this technique has not been extensively used to study experimental subacute stroke in primates, and the only approach used in previous reports has been single-voxel spectroscopy localization. By using a 2D matrix for spectral volumes, we were able to expand our analysis of cerebral metabolism to include the whole brain rather than to be limited to a single area. With this expanded view, we identified brain regions that showed radiologic improvement by conventional T2 imaging but that still showed pathologic alterations in metabolism by 1H-MR spectroscopy (Fig 3B, -D; voxel 3b). These regional changes in metabolism would likely have been missed with a single-voxel approach. LAC peaks were examined closely in this study because LAC is a universally accepted marker of anaerobic glycolysis, and the appearance of a LAC peak on 1H-MR spectroscopy spectra is a characteristic sign of clinical stroke.19, 26, 27, 36–38 Studies in humans have established that LAC levels are elevated in the hyperacute phase (<6 hours) after stroke38 and remain elevated above baseline levels for days to weeks.19, 28, 38–40 Additionally, Monsein et al23 demonstrated with single-voxel MR spectroscopy that LAC appears during the hyperacute phase of stroke in baboons. Using our multivolume technique, we confirmed the clinical findings that LAC is present ipsilateral to the stroke during the acute and subacute phases, particularly in the infarction core (Figs 1–3⇑⇑). Animals with small strokes (<30% of the hemisphere) had prominent LAC signals at 3 days, which trended toward baseline levels by 10 days (Fig 2), whereas animals with large strokes (>30% of the hemisphere) had strong LAC signals at 3 days that either persisted or increased by 10 days (Fig 3). The animals with large infarcts also had other findings, such as alterations in LAC levels in the right control hemisphere as well as in ischemic areas that were considered to be improved by T2-weighted MR imaging (Fig 3). In addition to LAC, we examined NAA peaks because studies using 1H-MR spectroscopy have documented that the reduction of cerebral NAA is a consistent hallmark of clinical stroke.22, 26, 27, 37, 38, 41 NAA is an acetylated amino acid that is found almost exclusively in neurons, and the loss of this metabolite following stroke is widely believed to reflect neuronal dysfunction and ultimately loss of cell viability.29 In human stroke, NAA levels fall and remain depressed in a time course that essentially mirrors the rise in LAC previously discussed.22, 26, 27, 37, 38, 41 Likewise, we found the same NAA trend in our experimental primate model, and volumes with elevated LAC levels generally had depressed NAA levels (Figs 1–3⇑⇑). As with LAC, examination of NAA peaks also revealed metabolically perturbed brain tissue that appeared either improved or normal by T2-weighted MR imaging (Figs 2 and 3). These findings further validate the usefulness of 1H-MR spectroscopy for identifying “injured” tissue that is not readily picked up by conventional imaging techniques. Interestingly, signals for NAA, CHO, and Cr were reduced in some spectra from the control noninfarcted hemisphere (Fig 2B, spectra 1a and 2a). This could be due to a transient effect of the arterial occlusion on the right hemisphere, which resolves at day 10 (compare the same spectra in Fig 2D). Further studies need to be performed to understand these spectral changes. There is increasing evidence that MR spectroscopy may not only serve to identify metabolically compromised cerebral tissues in vivo but may be able to aid in the prediction of functional outcome. Several clinical studies have associated higher levels of LAC in infarction cores with worse clinical outcomes following stroke.19, 31 These studies have been limited by their use of a nonstandardized ischemic insult across their subjects and the use of a single-voxel technique. In this study, we identified a significant biologic correlation (r2 = 0.73) between mean LAC levels in the ischemic hemisphere and a sensitive neurologic system. This correlation was not biased by the heterogeneity of ischemic insult, age of subject, and baseline comorbidities, typical of clinical studies in this field. We were also able to draw a significant correlation between NAA levels in the ischemic hemisphere and functional outcome. This correlation is not surprising because several studies have demonstrated that high levels of NAA are associated with better outcomes.30, 41–43 Overall, these findings suggest that the correlations observed between metabolite levels and outcome in clinical stroke have a basis in a controlled experimental model and that further investigation of these relationships is needed because outcome prediction following stroke is a clinical imperative. The main limitation for the in vivo application of 1H-MR spectroscopy is its limited spatial resolution. As demonstrated in this article in Figs 1–3⇑⇑, the voxel volumes need to be relatively large to maintain an acceptable spectral signal-intensity-to-noise ratio. Even though the quality of the spectra displayed in this study could have allowed us to reduce the voxel volume, the detection of small signals (such as LAC in some of the spectra) would have been compromised and the prolonged acquisition times would have been clinically unfeasible. This need for larger volumes for spectral peak detection is tempered by the importance of reducing voxel volume to prevent partial volume effects between normal and pathologic tissue (infarction) and to separate functional regions of the brain (ie, white and gray matter). Novel acquisition sequences, robust postacquisition processing algorithms, and the use of higher magnetic fields (3T versus 1.5T) are being tested to improve the applications of 1H-MR spectroscopy. The findings presented in this study have implications for future experimental primate stroke protocols and the role of 1H-MR spectroscopy in functional outcome prognostication. Primate experiments are expensive labor-intensive studies that come at significant cost to the subject, investigators, and society. The additional findings that our experimental primate stroke model displays the same metabolite profiles by MR spectroscopy as seen in human cerebral infarction lends further credence to its ability to substitute for clinical stroke in the evaluation of experimental neuroprotective and neuroregenerative strategies. Furthermore, the demonstration of substantial correlations between cerebral metabolite alterations and functional outcome in a controlled experimental setting provides further evidence for the validity of clinical studies suggesting that 1H-MR spectroscopy may play a role in predicting outcome in patients who have clinical stroke. We thank Ryan King, Stan Dicks, and Daniel Batista for their excellent technical assistance. This study was supported in part by the United States Public Health Service (NIH grants NS02038 and NS40409 to E.S.C. and CA58632 and CA62556 to T.R.B. ).